The multi-venue European exhibition of contemporary crafts in two Kilkenny locations features 74 makers from 19 European countries, including seven Irish craftmakers. For the 2018 edition of the European Prize for Applied Arts, artists were invited to draw inspiration from the paradoxical nature of a dual theme of monumentality and fragility, proposed by BeCraft (previously World Crafts Council – Belgique Francophone). WCC-Europe president Louise Allen observes: “As we navigate our way through uncertain times, this exhibition seeks to remind us of the fragility of our shared European community,” and exhibiting in Kilkenny “provides an environment for exchange and dialogue that contributes to our shared understanding of how culture can help to build community and bring cohesion”.The showcase of over 170 exceptional objects, in partnership with the Office of Public Works, will be displayed at two locations: the National Design & Craft Gallery, Castle Yard and Kilkenny Castle. Over 600 craftmakers from across Europe responded to the open call, and 74 were selected. Ireland is the only country to host this exhibition outside of Belgium. 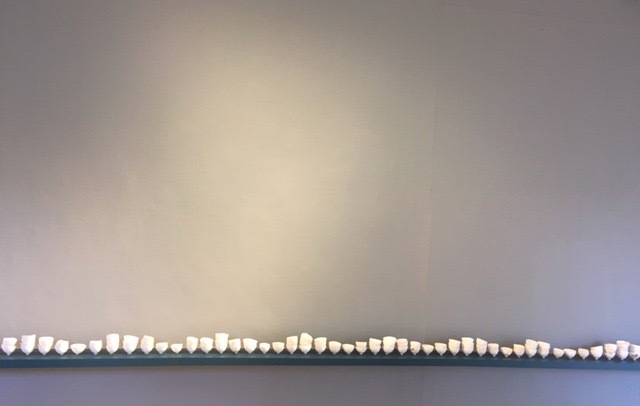 Ceramicist Nicola Kelly uses monumentality and fragility to explore loss and death, here showing a monument of 512 perilously stacked porcelain objects, corresponding to the number of days her partner survived from diagnosis to death. Kilkenny to host international contemporary crafts show next year. The final installation in The Design Yard, Kilkenny….. The body of work, 267/512, will be exhibited at WCC-BF, Site des Anciens Abattoirs, Rue de la Trouille, 17/02, B-7000 Mons, Belgium from 21st October 2018 to 20th January 2019 as part of European Prize Applied Art. In 2009, due to the lack of visibility the European Craft Sector, WCC Belgium Francophile (WCC- BF) in partnership with the City of Mons and World Crafts Council Europe organized the European Prize for Applied Arts. It was seen as a unifying and promotional event that would raise awareness of the skills and role of craftsmanship in the 21st century across the EU. This initiative, has run every 3 years since 2009. The need for and importance of this event is underpinned by the level of interest from craftspeople. In 2009, almost 600 artists from 28 European countries responded to the call for entries.